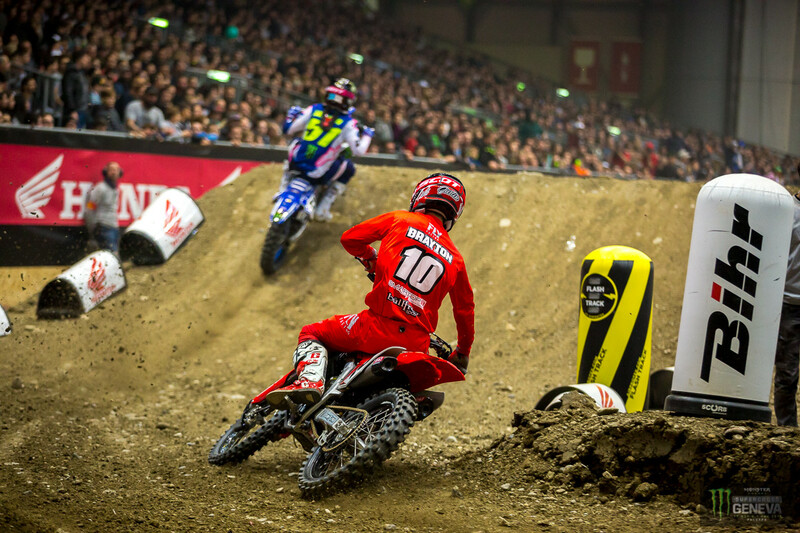 Justin Brayton has made a career, literally, out of going strong in off-season races, and the Geneva Sueprcross in Switzerland might be the place where he does his best work. Despite bad starts all weekend, the Smartop/Bullfrog Spas/MotoConcepts Honda rider pushed through the pack to get the overall win for the weekend with 1-2 scores. In the final race, he had to catch and pass Christian Craig to get the overall, and it looked difficult for a while, but Brayton did it and even closed up on race leader Justin Barcia for a bit. Steve Matthes talked to Brayton for his Geneva SX post-race show. Racer X: Let’s talk about your race. Christian Craig said, “I was feeling good in second. Everything was good. I don’t know where Brayton came from.” You started about fifth and it was on from there. 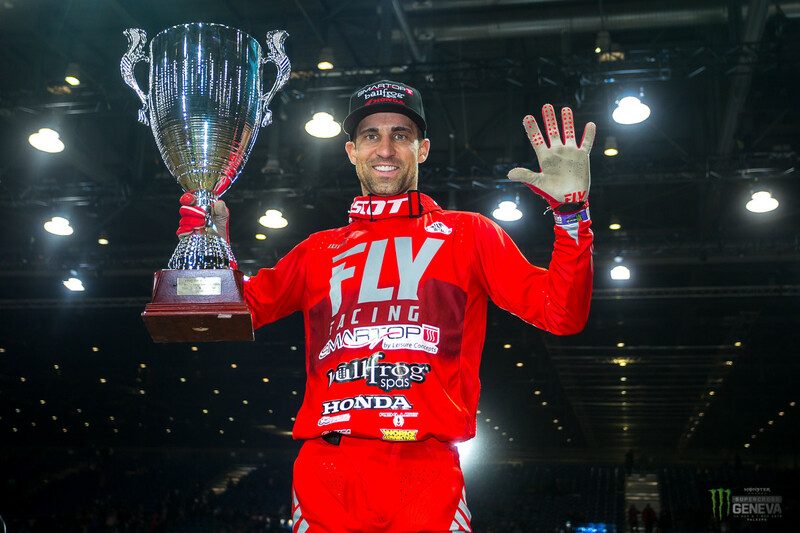 Justin Brayton: I don’t know what in the world was with my starts. Paris my starts were on, and for some reason this whole weekend… They were just horrendous tonight and last night. So, my work was cut out for me. I just started feeling it and got in a groove. I knew what I had to do to win, but I was feeling so good and I reeled in Barcia. I was like, I’m going to go for the win. A little bit of both. I caught him and I was like, all right, if I can pressure him into a mistake where I can get a couple bike lengths, like get behind him and get a couple bike lengths, I feel like I would have had it. I actually looked up at the clock and there was three minutes to go. I was like, all right, two laps. I’m like, all right. Go all in. Try and pass him, two laps. I didn’t make it happen. We were in some heavy lap traffic and I’m like, all right, I’ve got a big lead on third. Just kind of cash it in and get the king. Were you doing math with Christian? He would have had the overall with a 2-2. How close did you come to the carnage with Tixier and Osborne and all that? Didn’t even see it. I was so far behind on the start straight that my whole strategy was as soon as I get around this jump, dart to the inside. I had a huge hole. I was like, dang! I locked bars with somebody. It might have been Soubeyras, actually. Did he fall? I think he might have almost fell into me. Then I came out fifth and I looked up over the finish. I’m like, okay, there’s Christian. Barcia’s in the lead. Let’s go. I think to me the more impressive part was catching Barcia. Justin holeshot and was feeling it and by himself, and that’s generally a pretty good recipe on a 30-second track to take off. Then you just caught him. I don’t think he made any mistakes. I didn’t see anything. I think you were just going better. Yeah. I felt like everything was kind of coming together. My corners were connecting. I had really good whoops speed. That’s actually where I passed Christian and he was probably the best guy in the whoops the whole weekend, so it was good to pick it up there. Far left was working for you. Yeah, just because I could carry a good angle over the wall. When you went to the right of the whoops, you kind of had to hit the wall straight, and then didn’t really get that great of a draft. I was working the whole left side pretty much the whole night. Keeping one steady turn around the whole thing. I felt like that gave me a bike length or so. Honestly this track was just like, if you could gain half a bike length here and a bike length there, it felt like it all came together. Five times now, beating Marv’s record now. Now you’re the all-time king. Yeah, it’s funny. Me and Marvin just went back and forth. I would beat him one year, and then he would beat me. Last year he beat me to tie and obviously he wasn’t here this year. I’m sure he’ll be gunning for me next year. Hopefully I’m here to try and make it six. But it’s pretty cool to win it five times. When Craig was leading there and you’re in fifth or sixth early, I’m like, he’s got some serious work to do. And then you said when he got to third, it was over and you reeled in Craig. So, nice job. Impressive work. Even the heat race, going back to the heat, Christian was on it. I was doing everything I could to try and catch him. I don’t know if just the track was so fresh in the heat, but honestly when I got in third I’m like, you better be on it because Christian’s been riding good. So I just started feeling it. I do feel like the more the track breaks down, like with me doing so much racing, that’s the one thing where test tracks and practice tracks are so smooth and you do that one groove the whole time. Where with me racing as much as I’ve done, I’ve ridden some blown-out, nasty tracks where you have to change your lines all the time and you’re coming through lappers. So I do think that’s the one benefit to me racing as much as I have. I think it showed in that race. If I can get my starts worked out, which I feel like I can, I feel like it’s going to be another good year. That rhythm section, Seely was one of the only guys going to the inside. I was telling all you idiots that I timed it and it was faster on the inside. In the main event when you were in the action, when you were in the heat of it, outside of Seely, everyone was going outside. Seely is so good at that stuff. His little BMX style. He has been for years and years. Insides and he kind of pumps and he does that triple. I couldn’t do it as good as him. I think he was probably a couple tenths better through there, but me doing the same rhythm as him, I would probably still be two tenths. For me, outside, triple, triple, quad, it just worked for me. I could bring a little bit better angle to the turn. The outside rut was okay. The last five laps it was pretty nasty, but the inside rut I felt like was worse.